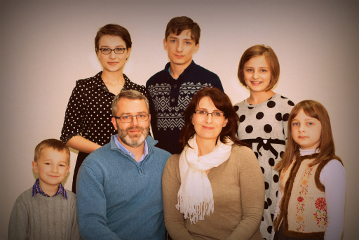 We serve in Odessa, Ukraine with a team of missionaries, our focus is on growing healthy Christ centered local churches through training in theology, leadership, evangelism and discipleship. Caleb serves as the vice president of the Church Ministries Institute, where he oversees their online training program. Caleb also serves as a pastor in our church Hope for People. Christina serves in women’s ministries at our church. She also works with a translation team that translates needed Biblical training materials into Russian. Christina also oversees homeschooling of our five children. In addition to this we are involved in personal discipleship, and work closely alongside Ukrainian pastors to help strengthen and multiply the church in Ukraine and beyond. We are sent by Discovery Baptist.